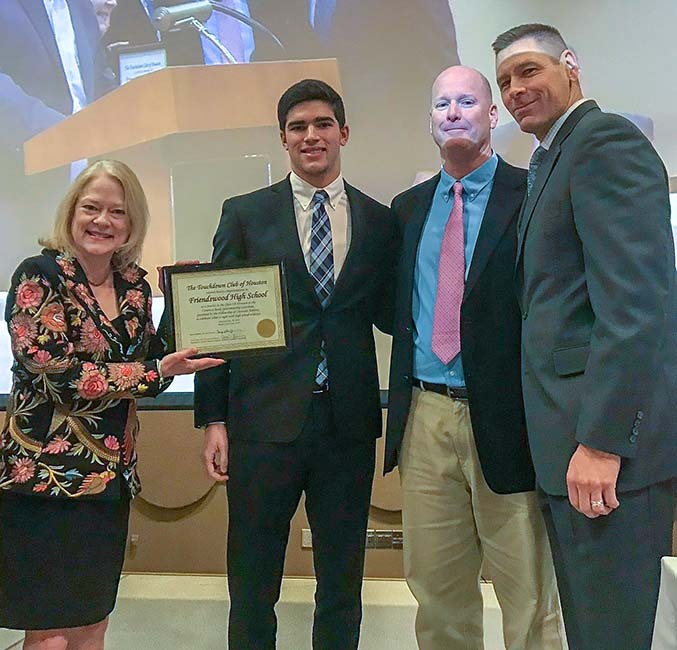 SPORTSMANSHIP FINALISTS - Friendswood was selected as a finalist for the Sportsmanship Award sponsored by Comerica Bank and presented by the Fellowship of Christian Athletes on January 30 at the Touchdown Club of Houston luncheon. 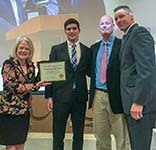 Friendswood's Austin Alvarez (middle left) and head football coach Robert Koopmann (middle right) were present to receive the certificate for being a finalist. This is the fourth time in seven years that Friendswood has been a finalist -- winning it in 2013. FRIENDSWOOD — The Comerica Bank Sportsmanship Luncheon, presented by the Fellowship of Christian Athletes, was on Jan. 30. The Friendswood Mustangs were selected as a finalist for the Sportsmanship Award by the Touchdown Club of Houston which is tribute to the integrity and character of the coaching staff and players during the course of a game. "We are honored to be a finalist for the Houston Touchdown Club Sportsmanship Award," said Friendswood head coach Robert Koopmann. "This is voted on by the Houston football officials and proud to say this is our fourth finalist award in the last seven years while winning the award in 2013." In the Class 6A division, first place was won by Cypress Springs, second place by Tompkins and third place by Pasadena Memorial. In the Class 5A division, first place was won by Angleton, second place by Waltrip, and third place was a tie between Thurgood Marshall and Manvel. In the Class 4A-Private School division, first place was won by the Kinkaid School and second place was The Village School. Special guest speaker was Houston Texans linebacker Dylan Cole. The judging was done by TASO, Houston football chapter, the referees who call each area high school football game. Class 4A-Private Schools: Kashmere, Kinkaid, Pasadena First Baptist, Rosehill Christian, St. John's, St. Pius X, St. Thomas, Village School, Westbury Christian and Woodlands Christian.